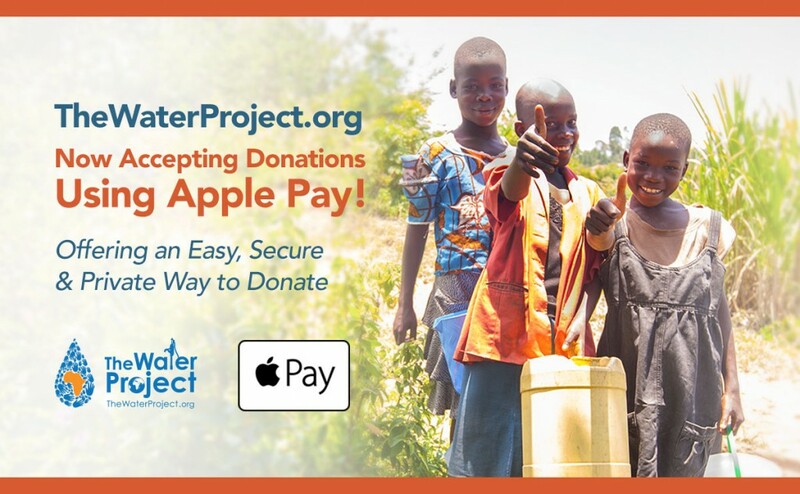 Concord, NH —November 14, 2016— The Water Project, a nonprofit providing clean, safe water and sanitation programs to communities in developing countries, brings supporters the ability to donate at TheWaterProject.org with Apple Pay, which is transforming mobile payments with an easy, secure and private way to donate that’s fast and convenient. Donating in apps and on websites accepting Apple Pay is as simple as the touch of a finger with Touch ID, so there’s no need to manually fill out lengthy account forms or repeatedly type in billing information. Clean water is the world’s leading path to improved health, opportunities for education, economic development and thriving communities. Each year, over 7500 supporters worldwide help communities in need of safe water through The Water Project. We are committed to bringing people together to solve the problem of finding clean water. Whether it’s our local teams in the field, the folks back at our headquarters, our donors and fundraisers or the communities we serve, these relationships are the heart and soul of our work. The Water Project seamlessly links the lives of our givers to the lives of those they impact through their donation. Every donor, linked to a specific water project, experiences the powerful results clean water. Creating a consistent, accessible and safe environment for this relationship is critical, and Apple Pay promises to be a powerful tool in continuing our mission. Apple Pay is easy to set up and users will continue to receive all of the rewards and beneﬁts offered by credit and debit cards. When making payments for goods, services and donations on the go in apps or Safari, Apple Pay works with iPhone 6 and later, iPad Pro, iPad Air 2, and iPad mini 3 and later. You can also use Apple Pay in Safari on any Mac introduced in or after 2012 running macOS Sierra and confirm the payment with iPhone 6 or later or Apple Watch. TheWaterProject.org is a non-profit organization providing clean, safe water and sanitation programs in developing countries. Our commitment to in-country leadership and ongoing monitoring programs enable reliable community-based solutions to the water crisis.We make it personal. Every donor, linked to a specific water project, experiences the powerful impact of clean water.